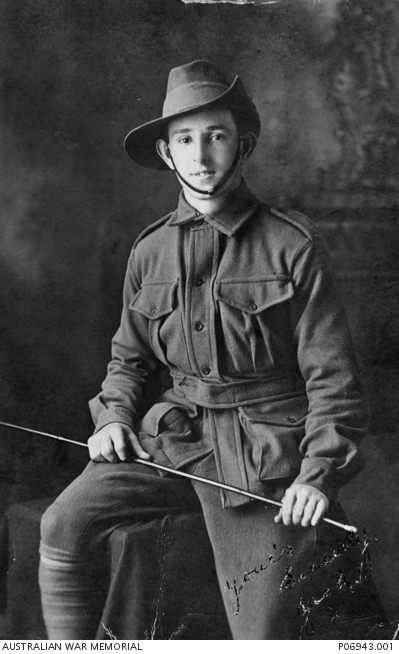 Studio portrait of 2826A Private (Pte) John Joseph Sullivan, 20th Battalion, of Sydney, NSW. A labourer prior to enlistment, Sullivan embarked with the 20th Battalion from Sydney aboard HMAT Euripides on 2 November 1915. Transferring to the 56th Battalion in February 1916, Pte Sullivan arrived in France with his unit in June of the same year. Little more than a month after his battalion entered the front line trenches for the first time, Pte Sullivan was killed in action on 30 August 1916, aged 18, and was buried at Y Farm Military Cemetery, Bois-Grenier, France.